‘People Data for Good’ was the theme of the recent People Analytics & Future of Work conference in San Francisco and will remain so for the PAFOW shows in London on 24-25 April and Philadelphia in September. Al Adamsen and I selected this theme based on our recognising the need for the people analytics community themselves to lead the conversation around how people measurement and analytics is being used to benefit the workforce as well as the leaders and organisations they serve. As data generation and use becomes more pervasive, it's now the collective challenge of the community to understand the boundaries and, in turn, choose wisely. Indeed, recent research by Accenture found that unlocking the value of workforce data through creating employee trust could be worth US $3 Trillion of additional revenue to the 6,000 largest publicly listed global companies alone. This infers that not only is the theme of People Data for Good the ‘right’ thing to do for workers, it is also essential for business. It is not surprising therefore that ethics is one of the four key strategic imperatives for people analytics and continues to be front and centre for all the people analytics leaders I meet. 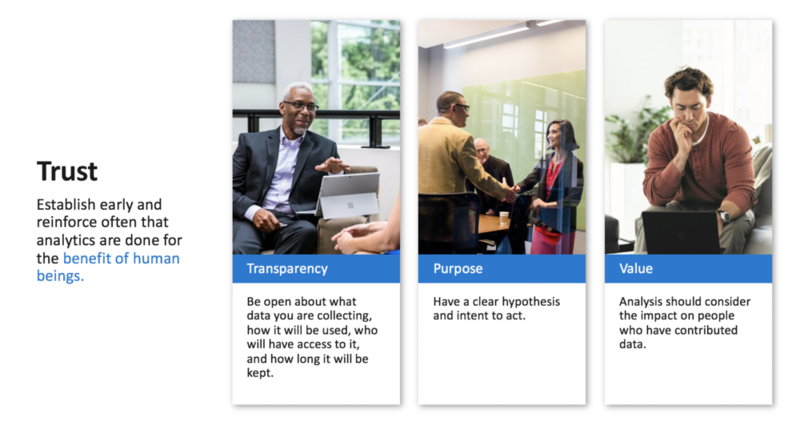 An indication of the importance of these topics is the work we did last year with members of Insight222’s People Analytics Program, which saw the co-creation of an Ethics Charter. One of the leading proponents of ‘People Data for Good’ is Dawn Klinghoffer, Head of People Analytics at Microsoft. Of all the companies I’ve met with in the last five years, Microsoft’s people analytics capability is one of the most advanced I’ve encountered. This is testament to the hard work and vision of Dawn, who has led the people analytics function at Microsoft since 2005. Dawn regularly shares insights from her work and that of her team. 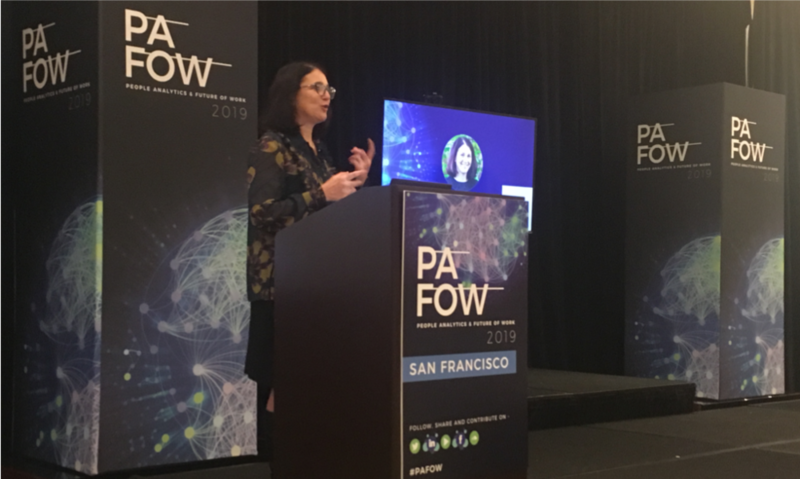 She spoke at PAFOW in San Francisco on how to build trust with people analytics. I caught up with her soon after to understand more about her approach. 1. Dawn, we’ve known each other for a while and you’ve always been a consistently strong proponent of ‘people analytics for good’. How important is employee trust to creating and sustaining an advanced people analytics function? Organisational people analytics is different from other types of analysis involving data about people, such as medical research in terms of legal rules and protections, but at its core they require the trust of the people involved in order to be successful. Without trust, there can be unintended consequences to recruiting, retention, morale and employee engagement. For this reason, trust is the foundation of a successful analytics program. In my opinion, people analytics is a privilege, not a right. A really good people analytics leader knows how to be innovative without eroding employee trust – it is easy to come up with lots of innovative ideas, but harder to ensure that sustaining employee trust is considered. 2. What are the key components of building employee trust with people analytics? Transparency: At Microsoft, we believe in telling our employees what we’re doing with their data and standing behind it. Our philosophy is that notice precedes use. Purpose: Randomly looking into data can be perceived as intrusive and disrespectful to the data subjects and can result in projects that are unrelated to the priorities and values of the organisation. Having a clear purpose and intended action can help focus the work you are doing. Value: People will not trust organisations that use their personal data to their detriment. Your value proposition should at least consider how employees and the organisation will be impacted by the outcomes. 3. Ok, let’s take each of those three elements in turn staring with transparency. What are the steps you recommend adopting to build trust with employees through transparency? There are many ways to provide transparency; these can be through statements, notices, policies or other methods of communicating with employees. Transparency is important both before and after an analytics project. Where/when appropriate, a great way to build trust is to share how data was used, what action was taken, and how employees benefitted. This reinforces the value of people analytics as a function and shows how the data was used as promised. 4. The second step of your methodology is all about Purpose. What do you mean by this and typically, outside the people analytics team, which stakeholders are typically involved in successfully navigating Purpose? This goes back to one of our basic principles of people analytics. Before doing any type of analysis, what problem are you trying to solve? The next question that should be asked is if the business is ready to take action based on the outcome. If you can get answers to both of those questions, you are well on your way to having a purpose. In terms of the stakeholders that are typically involved in successfully navigating and determining the purpose, it is a partnership between the data owner and the data consumer. In the case of people analytics, that is typically HR and the business. One of the best practices we use in any analytics project is the principle of data minimisation. First and foremost, there should be a clear purpose behind each data element in your data set. De-identification or anonymisation is another important step when you are looking for broad trends and insights. Some analytics require identifiable data to join other data elements, but report results in aggregate. 5. The third step is related to Value. What are the elements required in developing a Value Proposition for each analysis (or project)? Consider the impact of the analysis on both employees and organisation. One of the best ways to do this is when communicating a program change or enhancement, talk about the analytics that were involved in making the decision – and the intended outcome the company hopes to achieve. Follow up to ensure the outcomes were realised – and if not, iterate and evaluate again. Rarely are analytics projects one and done. It is a continuous cycle. 6. Can you provide an example of a people analytics project at Microsoft that provided clear demonstrable value to employees? At Microsoft, we tend to send a lot of email – which isn’t a big surprise since one of our products is Outlook. Recently we were looking into the concept of collaboration overload. By using Workplace Analytics, we were able to correlate email behaviour with perceptions of work-life balance from our annual engagement survey. The results were not surprising. 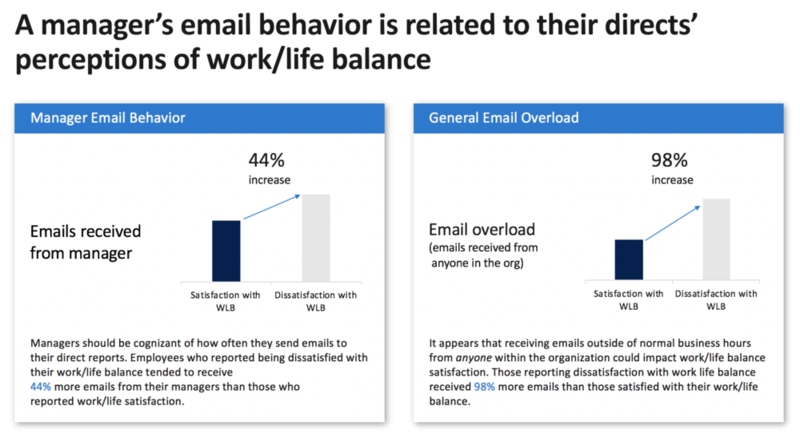 Overall, as managers send more email to employees, it can impact the employee’s perception of their work-life balance. Looking at all after hours email activity – emails from anyone in the organisation outside of normal business hours, can also have an impact on employee’s perception of work-life balance. The brilliant part of the story is that this outcome was built into MyAnalytics, which is an add-in to Outlook, so now when employees are getting ready to send an email at 10pm in the evening, a little notification pops up and asks if you are sure you want to send that mail – potentially reducing the impact that after-hours email might have on an employee. 7. How have you put Employee Trust into action with regards to People Analytics at Microsoft? Obviously, we are learning as we go – but there are many similarities to customer data privacy. We now have a volume of Microsoft Privacy Standards dedicated to employee data. We also have a Data Use Framework for employee data and a Data Protection Notice for employees. Many of our internal tools and projects have more detailed communications laid out in internal SharePoint sites for specific data use programs. We created an Employee Data Governance Board to provide consistent company-wide direction and oversight on the legal and corporate policy issues reflected in the company’s privacy standards for processing employee personal data. This governance board is made up of a core team of privacy managers and attorneys for HR, Finance, and IT. In addition, with the proliferation of analytics across the company, and the need to combine employee data with business data, we created a data analytics governance framework that we use when embarking on a new people analytics project. This ensures the right people are involved from the beginning, including legal, HR and any business stakeholders in addition to the people analytics team. 8. How do you build expertise in your i) People Analytics team, ii) wider HR and HRBP community, and iii) business with regards to employee trust and privacy? We realised a while ago that having a privacy manager on the team was critical to our success. Her focus area is people analytics data privacy and security as well as partnering with other areas of Microsoft outside of HR on their use of employee data. This, along with our Data Use Framework is extremely important in educating the business on the appropriate use of employee data for research and product development. One of the most successful ways we have built expertise within the wider HR and HRBP community is having a mandatory annual training for HR on privacy and data use. Every year the content changes depending on the environment or where we see opportunities to educate. 9 What is the role of company culture in terms of creating employee trust? I know your CHRO, Kathleen Hogan, has publicly stated that it is important that Microsoft employees are able to leverage and benefit from their own data. How this helped you and your team? Every company has a unique culture, and I am fortunate that Microsoft values trust with our products and services that we deliver to our customers.That also carries through internally through our cultural attributes: Growth Mindset, Diverse & Inclusive, Customer Obsessed, One Microsoft and Make a Difference.We want employees to leverage their own data to empower them and help them understand the levers to make changes that result in higher productivity and engagement. Having a strong relationship with your legal team and your CHRO can be empowering for a successful people analytics team to do the right work that results in positive outcomes.In the end, it is all about the people.Establishing and building trust, making sure that processes and people are in place to enable transparency, purpose and value will lead to good outcomes for employees, and in turn, their employers. Dawn Klinghoffer is general manager of the HR business insights team at Microsoft. Her responsibilities include advanced people analytics and research for Microsoft’s business units globally, as well as analytics and reporting support for human resources programs, such as global diversity and inclusion, global HR services, talent management, and learning and development. She is also responsible for reporting tools and technology supporting human resources and employee data privacy. Klinghoffer has held positions in both human resources and finance during her 21 years with Microsoft, prior to which she supported leading insurance companies as an actuary.